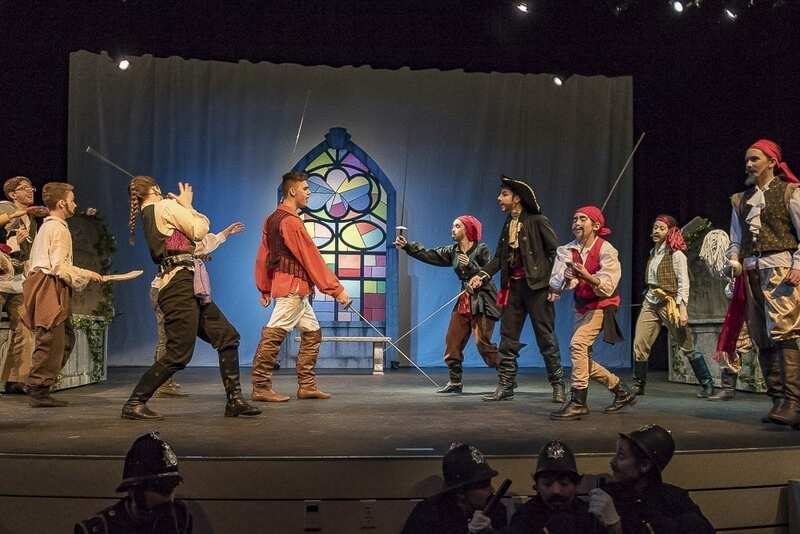 VANCOUVER — A clamour of swords, shrieks and running feet fill the auditorium of Fort Vancouver High School as pirates in the cast of Journey Theater Arts Group’s “The Pirates of Penzance Jr.” rush onto the stage in an excited frenzy. A hilarious tale of pirates, romance and misadventure begins. 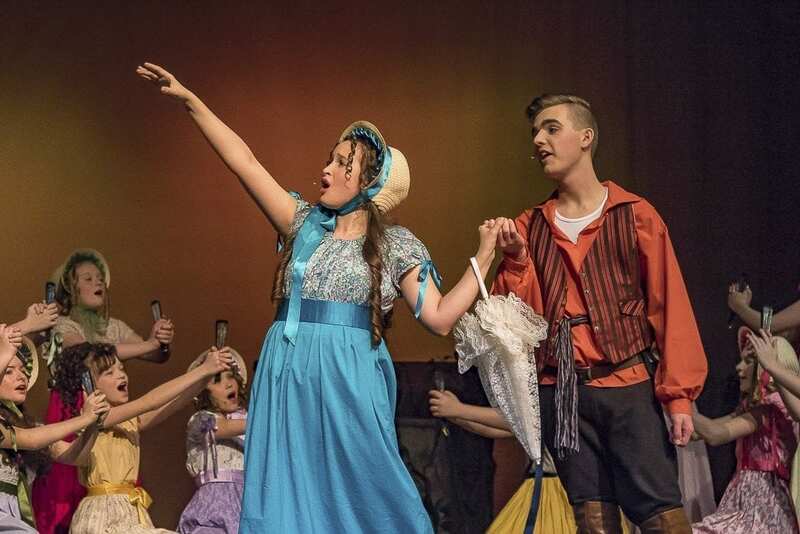 Thursday evening’s dress rehearsal was the final one before “The Pirates of Penzance Jr.” opens to audiences Friday night. It marks the debut show for 2018 of Journey Theater’s Vancouver division. Director Melissa Bareford said that the play is an old one, having been first produced in 1865. It follows the misadventures of Frederic, a man who as a boy was inadvertently apprenticed to pirates and upon turning 21, seeks to leave the merry, idealistic band and defeat them. A romantic interest becomes involved. Senses of duty by all characters are called into question and become defined. Hilarity ensues. “It’s really just a funny show,” Bareford said. 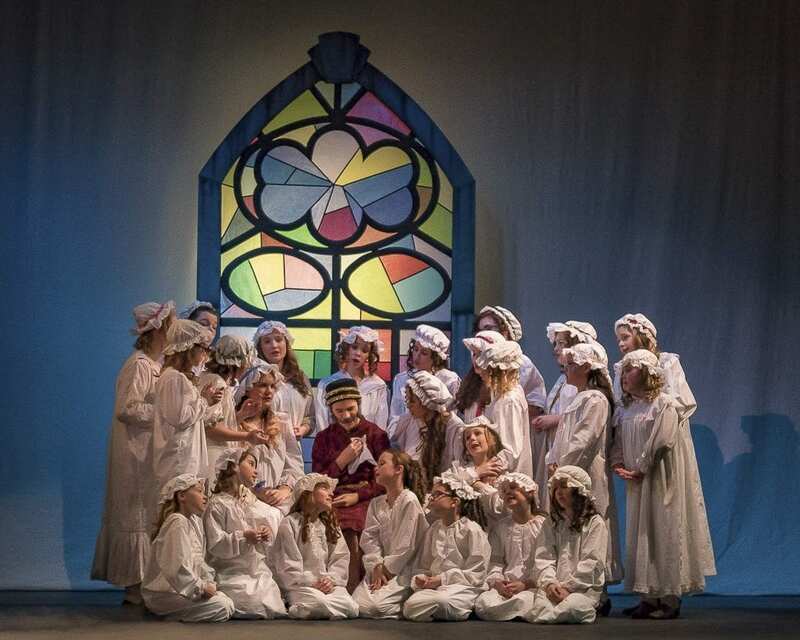 Bareford likened working with kids in the theater production to “controlled chaos.” From the view of an observer in the audience, Bareford and the rest of the Journey crew have done an excellent job of controlling that chaos. Show Coordinator Andrea Garner said that there are 85 kids in the cast and crew of the production, ranging in age from 8 to 18. Journey theater is not affiliated with any school, and so the young actors come from all walks of life and backgrounds. That diversity in background and ages is part of what makes any Journey production impressive. Unlike high school drama plays, there is not a single institution other than the production company that brings the kids together. However, that seems to provide the students the drive to excel. Garner said that Journey Theater gives kids interested in acting and performing the opportunity to learn and grow in their character and in their acting skills. No one is forcing the kids to participate, they are there because they want to participate, to act, to hone their craft. This author does not claim to have any expertise in theater productions, but the drive of the kids shows in their stage presence. 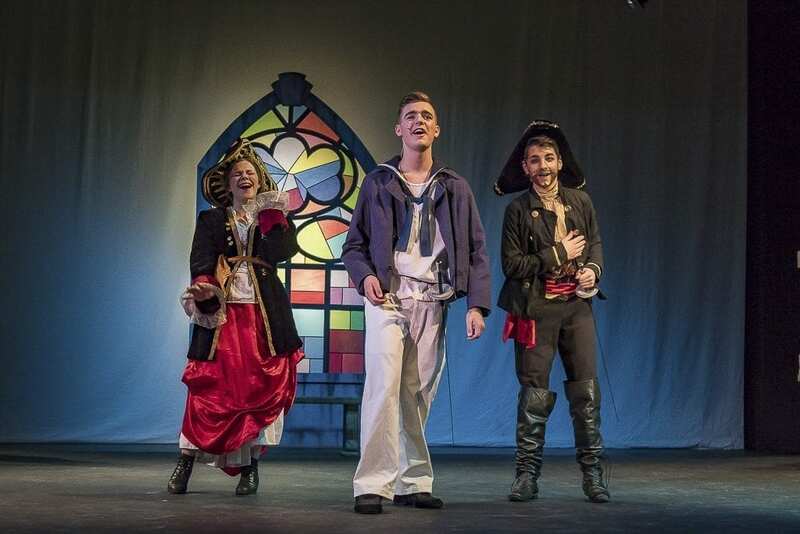 “The Pirates of Penzance Jr.” is an operetta, and is comprised not only of spoken dialogue, but of singing and complex dance numbers. It even features several intricate fight scenes. During the dress rehearsal, the young actors and actresses showed that they were well equipped to handle all of the needed skills, from speaking, to acting to dancing, or even a combination of the three. Any small mistakes that may have occurred were not allowed to affect any of the actors, and the audience is left mesmerized by the story and the actions of the cast. Perhaps the actors recognized their errors, but this author certainly could not pick them out. The actors and actresses in the play exemplify that passion for their art. Melanie Varvaroi, who plays female lead Mabel in the production, has been with Journey Theater for over two years, and this show marks her first time playing a lead role. Varvaroi explained that Journey Theater has helped her get out of her comfort zone and beyond her shyness. It has taught her how to grow as an actress, and done so in a welcoming atmosphere. Cameron Sears, who plays the lead role of Frederic, is participating in his first play with Journey Theater. He said that he loves to make the audience feel as if the character is real. “I just love portraying the characters,” Sears said. Sears explained that the music was one of his favorite parts of “The Pirates of Penzance Jr.” “The music is awesome,” he said. Like Varvaroi, Sears said that one of his favorite parts of working with Journey Theater is “the friends that you make there.” He also said that the company’s Christian message and basis is both encouraging and refreshing. Garner explained that Journey Theater is a Christian based organization that helps youth grow and mature in their art and in life. It is therefore much more than a mere theater production company. “Our goal is to help kids grow in their character and their talents in a safe environment,” Garner said. After the cast ran through the entire performance, Journey team members assembled them to provide critiques, advice and pointers for the opening night performance. Journey staff worked with some actors to make sure that their performances were as flawless as possible. However, despite some critiques and the last minute run throughs of dance routines, Bareford had high praise for her cast. “You guys are ready for an audience!” she told the cast after the dress rehearsal. This author could not agree more. 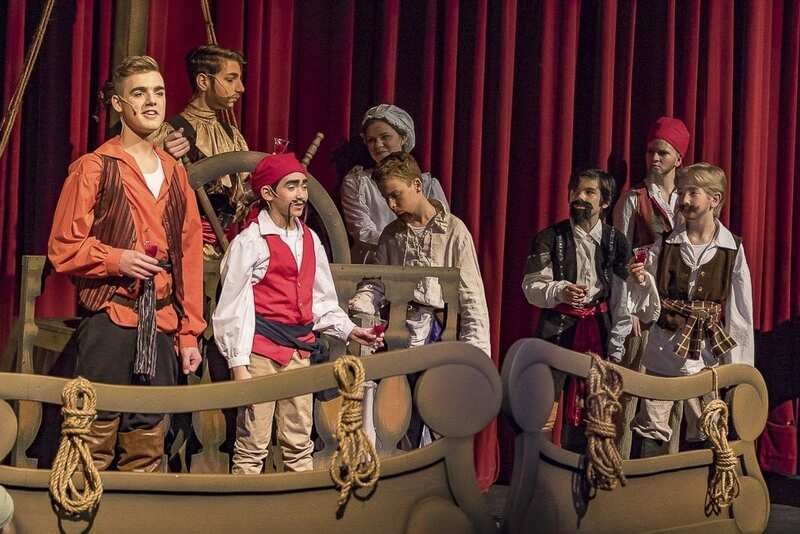 Journey Theater Arts Group’s “The Pirates of Penzance Jr.” opens on Fri, Feb. 16 at 7 p.m. Additional shows will be held on Sat., Feb. 17 at 7 p.m., Fri., Feb. 23 at 7 p.m., Sat. Feb. 24 at 7 p.m., and Sun., Feb. 25 at 2 p.m. All performances are at Fort Vancouver High School. Tickets can be purchased online at http://www.journeytheater.org/shows/pirates-of-penzance-jr/. Alex Peru is a 2017 graduate of Washington State University Vancouver. He has a bachelor’s degree in History and a double minor in Political Science and Business Administration. Peru grew up in Battle Ground, and graduated from CAM Academy in 2013. He worked for The VanCougar, WSU Vancouver’s campus newspaper, for three years, including one year as the editor-in-chief. When not working, Peru enjoys reading books about history, working on cars and enjoying the outdoors in Clark County’s beautiful rivers, lakes and forests.